Samsung’s upcoming Android Go smartphone, the Galaxy A2 Core has been the subject of a number of leaks and reports lately. The phone has already appeared on the website of many certification agencies across the globe. Now, 91mobiles exclusively brings you the complete specifications and pricing details of the smartphone ahead of the official unveiling. We have received the Samsung Galaxy A2 Core’s specs sheet as well as its pricing information from our sources in the retail chain. Our sources have revealed that Samsung is all set to launch the phone in India at a pocket-friendly price tag of Rs 5,290. As you can see in the specs sheet above, the phone will feature a 5-inch display bearing a resolution of 960 x 540 pixels. The handset will boot Android 9 Pie (Go edition) out of the box. 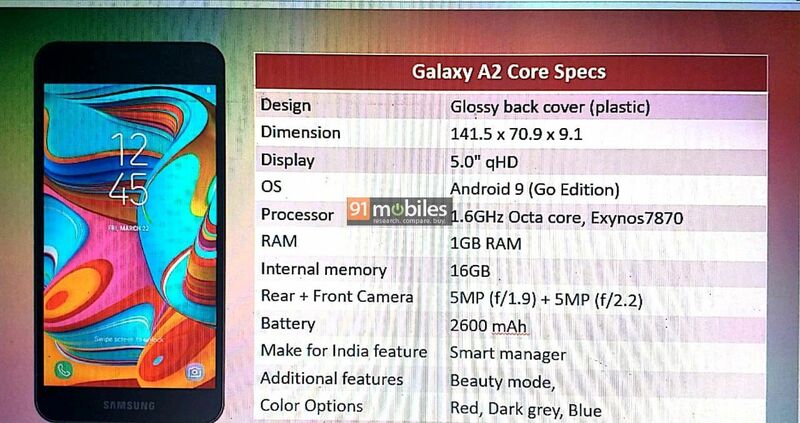 Powering the device will be a 1.6GHz octa-core Samsung Exynos 7870 processor, aided by 1GB of RAM. The phone will be equipped with 16GB of native storage, which is expected to be further expandable. In the camera department, the Galaxy A2 Core will feature a 5-megapixel primary camera at the rear with an aperture of f/1.9. For selfies and video calling, you will find a 5-megapixel snapper featuring an aperture of f/2.2. A 2,600mAh battery will keep the handset running. Design-wise, the phone will feature a plastic build and will be available in three colour variants — red, dark grey, and blue. The Galaxy A2 Core will succeed the last year’s Galaxy J2 Core, the brand’s first Android Go offering. The phone arrived with a 5-inch qHD display, a 1.4GHz quad-core Exynos 7570 SoC. The device sports 1GB of RAM, 8GB of expandable storage, an 8MP rear camera, a 5MP front shooter, and a 2,600mAh battery. The handset was originally launched for Rs 5,990, but is now available for Rs 5,490.